Friends and whanau farewell for the final time yesterday a world famous, Te Aitanga a Mahaki musician, Thomas Kini. Noted as a musical pioneer of his time, Mr Kini helped set the benchmark for fellow Maori musicians looking to break into the world entertainment industry. There was no funding for Maori musicians of that time, however this did not stop them from chasing their dreams of international stardom with a heart full of passion and whanau support. Mr Kini was an impressionable 16-year-old when he left New Zealand to play with the Hi Quinns, one of the earliest Maori show bands in New Zealand history. "He was a member of the great Maori show bands from the 1960s who set a precedent and paved the way for New Zealand music. These bands, the Quin Tikis, The Shadows and the Maori Hi 5s were an important part of New Zealand musical history. He more recently made his mark as a jazz musician in Chicago," said sister Pat Kini. Born and brought up in the Gisborne area, Mr Kini attended Central Primary School, Gisborne Intermediate and Gisborne Boys' High School. His entertainment career began as a 14-year-old guitar player, performing throughout Gisborne and the East Coast. His impressive career involved touring Australia, London, Europe and the United States. During a gig in Miami he was discovered by the leader of the Latin band Hondo Beat who encouraged Mr Kini to make Chicago his new home. In 1972 he played and recorded with the Brazilian jazz pianist Manfredo Fest whose group also included the Costa Rican percussionist, Alejo Poveda, with whom he became a life-long friend. Mr Kini also played and recorded with Minnie Ripperton in 1974 and Donny Hathaway for his recording "Extension of the Man" in 1975. He also played with countless other artists, including such luminaries as Stevie Wonder, Tito Puente, Herbie Hancock and George Benson, and was a favourite around the jazz clubs of Chicago. 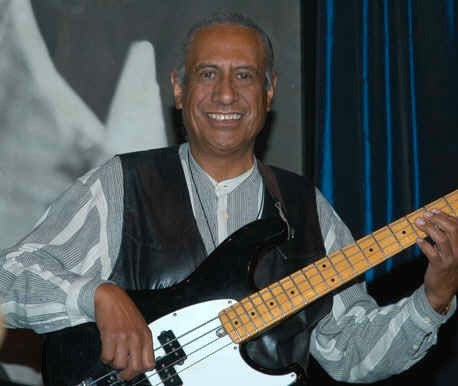 He was the bass player on all six of Bobby Lewis' CDs (1992-2003) and a most important part of the sound, feeling, and creativity of this recorded music. In addition to appearing in many jazz festivals and concerts in the US with the Bobby Lewis Quintet, he performed at the North Sea Jazz Festival in July 2000. "The world is a sadder place without the wide smile of Thomas Kini. He was without doubt one of the finest human beings I have had the pleasure of knowing and his musicianship was extraordinary," said former Maori Hi Quinns' member Lynn Rogers. Mr Kini, who was born in 1944, lay in state at Waihirere.